For 2019, still no new Pathfinder from Nissan. Instead, we get this "Rock Creek Edition". Which is basically a $995 package option available this spring. For that price, you get special wheels, black grille, door handles and roof rails. 2 tone seats and "premium" metallic interior trim. The current Pathfinder is one of the worst choices in a 3 rows SUV. Nissan is in desperate need of a new one. And quickly. Let's hope 2019 is the last year for this 6-year-old model. It has aged quickly. And there seems to be superior competition from every single company these days. The fact that this new "Rock Creek Edition" exists is as you say usual "end of life special edition stuff". Nissan is known to do this with it's models in the last year or two of their lifespan, so a new one can't be too far off. That said, I recall reading a comment here way back in August of 2017 from a supposed insider who said the next Pathfinder (W42R) was "a bit further out than planned". A google search for W42R Pathfinder brings up a Wards Auto document showing an SOP date of 9/1/2020 at Nissan's Smyrna plant. That would make the next Pathfinder a 2021 vehicle. Let's hope this is wrong. The Pathfinder isn't a terrible vehicle, but it definitely shows its age and the competition has long surpassed it. Previous Pathfinder redesigns were shown at the NY auto show. I have my fingers crossed for a debut this year. The Murano, Pathfinder and Rogue have passed their expiration date. They need something a lot more exciting to lure buyers and have car fans respect them once again. Maybe a new Xterra or Juke will bring magic back to the brand. This is a preview of the next generation Pathfinder. The next generation will be more rugged. Maybe a new Xterra or Juke will bring magic back to the brand." The Murano just received a refresh for 2019, so I wouldn't expect a new one for at least another two years. 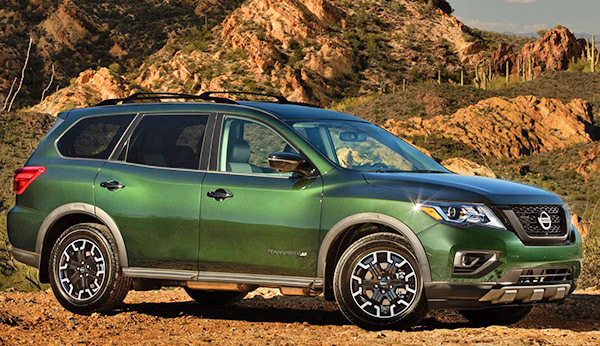 The new Rogue is due soon and I think if we see a new Nissan SUV in NY this spring, the new Rogue will be it. The poor Pathfinder is probably going to struggle thru another two years before it's replaced. By then the current Pathfinder design will be 8 years old... ancient in car years. I hope I'm wrong about that and the new one comes a lot sooner. Its funny how these days you have to pay for an "upgrade package" to get black grill, door handles, roof rack... Prior these kind of things were in base models of most vehicles and one would have to pay to get away from this stuff! Manufacturers must be laughing all the way to the bank thanks to those that opt for these stuff.